Back in 2004 I committed to a contest put on at iDevGames.com. It was called 21 Days Later: Vectorized. It was sort of a mini contest in between the bigger uDevGames contest that was meant to be yearly (and is currently running at the time of this post.) The entries had to be finished in 21 days and the visuals had to look like the old vector games as used for the sit-down Star Wars arcade game, Battlezone, Tempest or the original Asteroids. Long story short 4 of 5 judges couldn’t play my game, Space Barrage, as it crashed for them. After the blood, sweat, and tears it was a tough break… but I barely cared. It was the first completed game I had made since I was an adult. Furthermore, it can be a fun, addictive game. It’s a little closer to the game concept of Rampart by Atari than I wanted. I had many expanded ideas — of course I did — but not enough time — of course not. The fun part is that anyone can still play this game. It’s arcade-style endless. What stage can you reach? Click here for Windows. Click here for Mac. 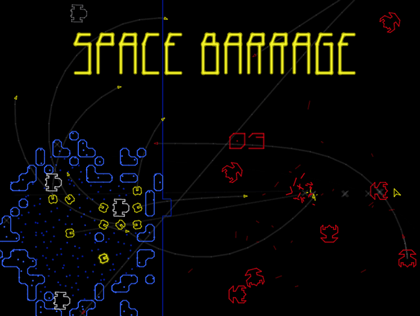 You lead a convoy of transportation barges across enemy space. The barges themselves are without weapons, but when the enemy attacks, you can unleash your deadly cargo. You are transporting weapons supplies, so use the shield generators to set a perimeter and distribute your missile launchers inside. If the enemy gets too close, you’re done for. Incidentally, I was using some freely available code by arekkusu. He was developing it during the contest and had his own fully 80’s awesome retro-homage game called Shoot Things. It’s short sweet and only for Mac as far as I can tell. And yes, there is an updated, unfinished version laying around that doesn’t rely on the vector graphics. It’s not ready for public consumption… yet. This entry was posted on Sunday, February 8th, 2009 at 7:54 pm	and is filed under Blog, Games. You can follow any responses to this entry through the RSS 2.0 feed. You can leave a response, or trackback from your own site.